WASHINGTON — President Donald Trump promised Wednesday that a "big" and "strong" border wall is "very, very on its way," even as Congress moved toward considering a Homeland Security spending bill that would provide for the construction of about 55 miles of new steel fencing. 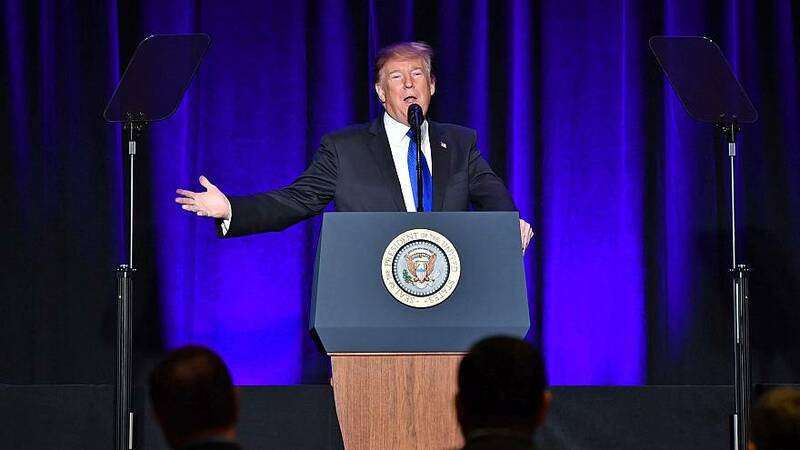 "As we review the new proposal from Congress, I can promise you this: I will never waver form my sacred duty to defend this nation and its people," Trump said in a speech to a conference of city and county sheriffs in Washington. "It's a wall that people aren't going through very easy. You'd have to be in extremely good shape to get over this one. They would be able to climb Mt. Everest a lot easier, I think." And though no new wall is currently under construction, Trump again told an audience that the barrier is being built now. "The wall is very very, on its way," he said. "It's happening as we speak. We're building as we speak in the most desperately needed areas. And It's a big wall. It's a strong wall." Trump has said that he will find a way to build the wall without new money from Congress, and his aides have considered various proposals to use existing federal authorities — including a possible declaration of a national emergency by the president — to free up cash and manpower for that effort. But he has also said that he expects such a move would end up being challenged in the courts. The text of the legislation under consideration on Capitol Hill still has not yet been released, but it would provide nearly $1.4 billion for 55 miles of new fencing — less than the $1.6 billion for 65 miles of new fencing that the Senate approved late last year before a 35-day government shutdown. Trump's most recent funding request included $5.7 billion for 234 miles of steel fences.